On Thursday, LaVar and Lonzo Ball released their first shoe, the ZO2. You can see it below; I actually like it quite a bit. The problem is they cost $500 and don't ship until late November. The pressure that is going to be on Lonzo to start next year is ridiculous. And you know ESPN will be all over this until then. Shout out to Shaq for a dynamite tweet (and making his shoes relevant again). 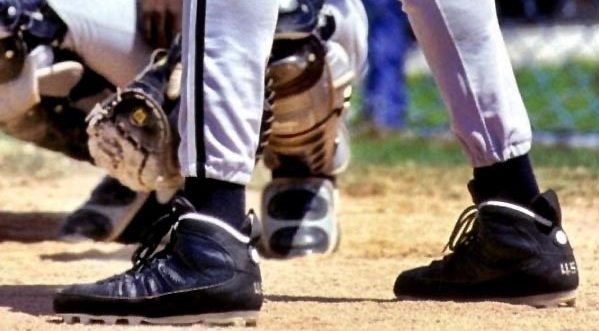 All this shoe talk got me thinking about baseball cleats, a very underrated part of the baseball uniform. The reason for this, in my opinion, is because they are normally pretty boring. There isn't a huge motivation from the shoe companies to make cleats look cool because you can only wear them on a baseball field. If the only people that bought Jordans were basketball players, the market would shrink considerably. If MJ didn't play baseball, would we have Jordan baseball cleats? Also, what's in the briefcase, Michael? Jordan's first baseball player besides himself? Derek Jeter. From a New York Times article in 1999. This reminds me of the best baseball commercial ever.